LG officially announces G Pro 2 phablet; features include 4K recording | What Hi-Fi? LG has officially announced the G Pro 2 phablet. It packs in a 5.9-inch full HD display and 13-megapixel camera with 4K recording. LG has officially announced the G Pro 2 phablet ahead of the Mobile World Congress, which takes place in Barcelona later this month. 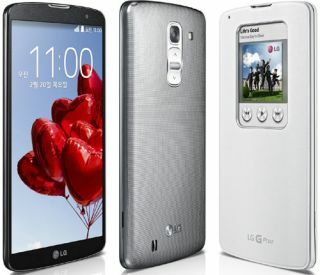 LG unveiled its predecessor – the Optimus G Pro – at MWC 2013, so its likely LG will bring the new device to the event this year. It is worth noting, however, that the G Pro never officially made it to European shores. The G Pro 2 is LG's answer to the Samsung Galaxy Note 3, HTC One Max and Sony Xperia Z Ultra. It features a 5.9-inch, 1920 x 1080 full HD display, 2.26GHz Qualcomm Snapdragon 800 processor with 3GB of RAM, 16/32GB of onboard storage and 13- and 2.1-megapixel rear and front-facing cameras. The rear camera is capable of recording in 4K and can even shoot at 120 frames per second for slow-motion video. Features include the ability to effectively shrink the size of the display down to between 3.4- and 4.7-inches for easier one-handed use. Magic Focus allows users to alter the focus of an image after it has been taken and Natural Flash aims to make photos look more natural and less "washed out." No word has been released on pricing or availability yet, so we'll be looking to Mobile World Congress for the answers. Keep checking back with whathifi.com as we'll bring you all the latest from the Barcelona showfloor.